Here you can find a strain description about Donbass Star and also some user-based reviews and infos directly from the SeedFinder (if available). 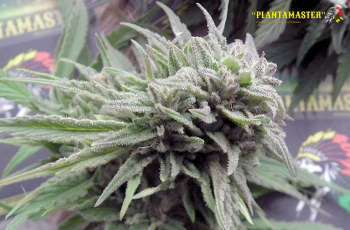 You can also find the offers and auctions here if Donbass Star cannabis seeds are on stock at MyCannapot right now. This variety of marijuana got its name as a sign of respect and deep gratitude to our distant homeland - Ukraine and our Ukrainian friends have not forgotten how to look at the stars and stand firm in all circumstances. In Donbass Star smell on bloom a blast! Sweet and pungent floral diversity somehow smells something. And he also acts as unusual - and then almost instantly. Exhale, and you know that's it :) Donbass Star - is the result of repeated and long-term cross between vysokopotenentnym East Ukrainian landrace, Black Domina and Tangerine Dream. The rapid growth and short flowering cycle of landrace organically combined with the power of influence and an abundance of crystals Domina, and genetics Tangerine manifests as pronounced HIGH, allowing feel fine surroundings and enjoy life, without going into unnecessary reflections, enhances creativity. Suitable for social applications, as strengthens the ability to communicate, ability to handle stress and creative inclinations. Floral-musky aroma, slightly sweet. Has a distinct clinical effect and effectively neutralizes pain, nausea, muscle cramps and depression. The smell in the bloom light, more like a smell of wildflowers than the smell of cannabis appears near the end of flowering, that allows to grow Donbass Star without the air filter in place. A medium-sized plant has a dense structure with broad leaves. It tolerates drought and light does not like brining substrate. Inflorescence densely covered with crystals allow easily get quality hashish in the ice extraction . Donbass Star easy to grow both outdoors and indoors. Outdoors the plant is ready to harvestin the second half of September, which will undoubtedly please the inhabitants of those countries where autumn comes early. Maturing at 7-8 weeks of flowering Donbass Star allows you to get up to 950 grams per plant grown outdoors and up to 350 grams per plant when grown indoors. Buy Donbass Star now at MyCannapot!